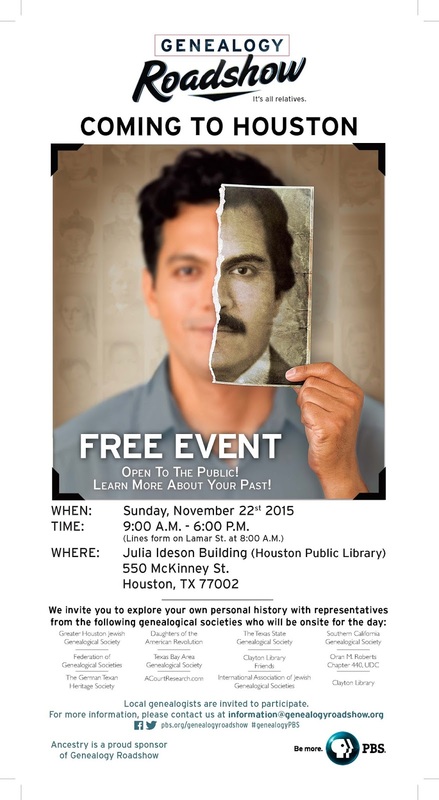 PBS Genealogy Roadshow will be filming in Houston, Texas on Sunday, November 22 from 9:00am to 6:00pm. I will be on hand representing the Lonestar Chapter of the Association of Professional Genealogists (APG) at our information table. If you are curious about genealogy, this is your opportunity to learn more and maybe get a chance to star on TV! The Genealogy Roadshow is being filmed at the Julia Ideson Bldg. (a.k.a. Houston Metropolitan Research Center or old Houston Public Library) located at 550 McKinney St., Houston, TX 77002. Parking Info: 1100 Smith Garage, 1100 Smith St., Houston, TX 77002; Street parking is free on Sundays. There are three genealogists that star in this show. I met Josh Taylor and Kenyatta Berry at the Federation of Genealogical Societies meeting in San Antonio last year. I am looking forward to meeting Mary Tedesco because we share an interest in Italian genealogy. The television shows that feature genealogical research are very useful for building excitement and enthusiasm for genealogy among the general public. 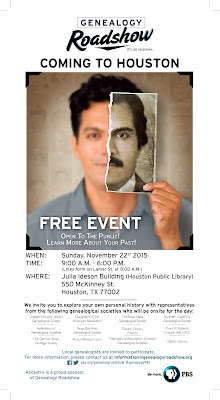 This is a great opportunity for the genealogy community of Houston and the State of Texas to offer assistance to the attendess at this free event. Mark your calendars and plan to be there. In other developments, I am just returning from the Texas State Genealogical Society (TSGS) meeting in Austin over the weekend. I was nominated to serve as Vice President of the Lonestar Chapter of the Association of Professional Genealogists. I was also confirmed as District 4 Representative to TSGS. I saw some outstanding presentations and made many new friends at the event and look forward to serving the genealogical community throughout the year in my new roles.